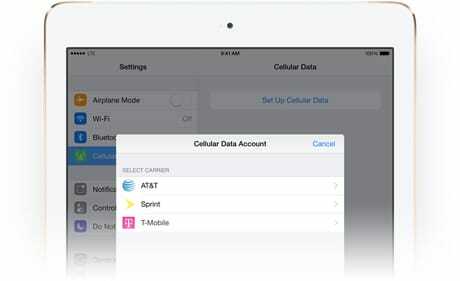 Buyers of the iPad Air 2 will be the first to use a new Apple SIM that comes preinstalled in the Wi-Fi+Cellular version of the tablet and looks set to be the first implementation of a “SIM Within” patent published in November 2011. The publication of the patent followed widespread rumours that Apple was working with SIM and NFC specialist Gemalto on a virtual SIM concept and was widely seen at the time as providing a way for Apple to cut carriers out of direct relationships with iPhone users. “Conventionally, user equipment is provided with a Subscriber Identity Module (SIM) card,” the patent explains. “The SIM card includes security information such as private key information that can be used in authenticating user equipment to a cellular network. “It may not always be desirable to require the use of SIM cards. For example, the need to include a SIM card slot in user devices tends to make the devices bulky and add cost. It also necessitates management of SIM card inventories and distribution by the manufacturer or service provider. AT&T, Sprint and T-Mobile in the US are supporting the service at launch along with UK carrier EE.